The exhibition opened to the public last Friday, drawing a crowd of students and community members to the main gallery where 12 artistic prints donated by Glaser had been blown up to over 10 times their original size. The exhibition also features additional original works by the artist, on loan from him, in the mezzanine gallery above the main floor. The artistic style of the blown-up prints consists of layers of shapes, lines and dots that come together to create an image of a landscape or a figure. For those unfamiliar with Glaser, the work bears similarities to Georges Seurat’s famous 19th-century painting “A Sunday on La Grande Jatte,” which is composed entirely of dots. Glaser, who will turn 88 this June, has an interest in at what perspective to an image viewers see pattern and at what perspective they see form, and it was he who suggested that it would be interesting to enlarge some of his recent works for the exhibition. Blazo Kovacevic, the curator of the exhibition and an assistant professor of art and design at BU, thought that the idea of blowing up the works was a great way to elevate the exhibition into something greater than an average display. “It was an opportunity for us to showcase our capability as a school and as a department with the new technology we’ve obtained,“ Kovacevic said. 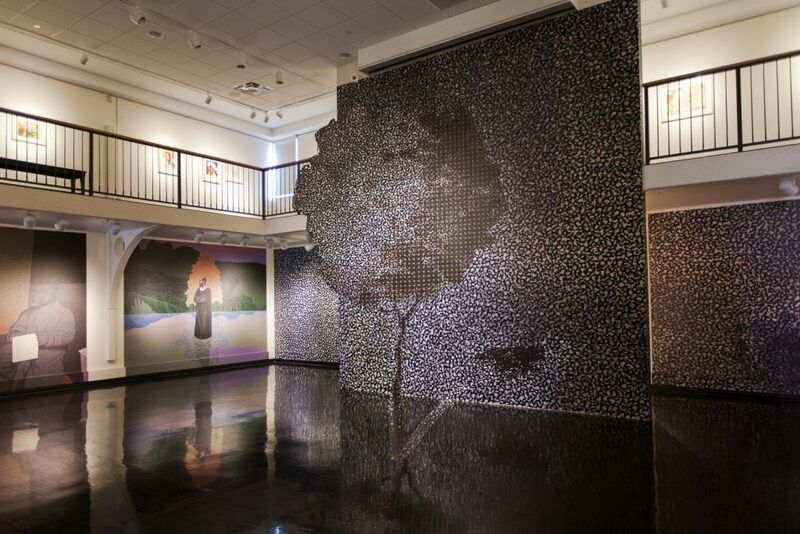 The large prints were created in the basement of the Fine Arts Building by printing on a material called Photo Tex, using an ultraviolet printer. The final products adhere to the walls of the gallery like wallpaper, allowing the museum to forgo frames and stretch the prints over the bumps and grooves of the wall. Marc Newton, the photo technician of the exhibition and the photography specialist and digital media technician for the art department, said that this creative decision caused the printing process to take a full month to complete because of the in-depth measuring of the gallery’s precise dimensions. Preparation for this exhibition was not only time-consuming, but financially significant as well. In addition to manufacturing the large prints, the museum also created a catalogue book of Glaser’s artwork to sell at the exhibition. Butler was in charge of fundraising for the exhibition and made the decision that even though the project was ambitious, it was worth supporting. In this particular exhibition at BU, the effect of the art style is significantly enhanced due to the size of the prints. If viewers stand at the same distance from the wall that they’re accustomed to standing at when viewing artwork, they’ll only see a pattern of shapes and lines. They are forced to take a few steps back to understand the image these patterns are creating. For some patrons, this establishes a whole new relationship to the work they’re viewing. “Modulated Patterns” will be on display until May 20 during regular BU Art Museum hours.